Upgrade to "Do It All" Package for Just $45 More and Enjoy Parasailing and Banana Boats! Climb aboard our luxury 72’ double decker catamaran as we set sail for a day of fun and adventure at sea. As we head for our snorkel location, settle in for narrated sightseeing tour as we make our way around Paradise Island. On the crystal clear waters of the “Tongue of the Ocean” you’ll receive a brief overview with instructions and safety tips, as well as how to best use your equipment. Gear up in your complimentary snorkel equipment and dive into the cool Caribbean waters where you’ll freely explore this intriguing ecosystem. Spot tropical marine life that inhabit this intricate reef such as starfish, nassau grouper, moray eels, sea turtles and more! Once you’ve had your fill of snorkeling take an exhilarating ride on a jet ski along the deserted island coast of Athol Island. A full Bahamian style lunch is served before relaxing on this tropical beach, you’re also free to enjoy beach games and activities with the crew! This tour is perfect for the whole family with something for everyone to do. Minimum age is 18 years old to drive jetski, children can ride with an adult. 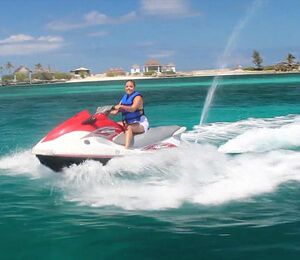 I have been to the Bahamas many times, but Bahamas Ocean Snorkel & Jet Ski Combo is one of my favorite trips! It includes everything that everyone should do here. As a Bahamas veteran, I can say only the best about this experience!